Read the two papers 'Baby pictures' by Deborah Freedman Lustig and 'Families seen sightseeing' by Jonas Larsen. Both take an ethnographic approach to family photography: Lustig examines what the studio portraits of their babies mean to a group of young mothers, and Larsen looks at how families visiting a tourist site take photos of themselves. to explore different kinds of ethnographic methods. Lustig, S.F. (2004) 'Baby pictures: family, consumerism and exchange among teen mothers in the USA', Childhood, 11: 175-193. Larsen, J. (2005) 'Families seen sightseeing: performativity of tourist photography', Space and Culture, 8: 416-434. 1 What theoretical position does each paper adopt? What are their key terms? Interestingly, neither start by discussing photographs as particular kinds of images. Both begin with accounts of specific social identities. But these accounts are rather different from each other. So, for example, Lustig seems to me to be more interested in questions of social relations, race, mothering and class, while Larsen is most interested in performance, embodiment, tourist-ness and the family. Larsen also explores the non-representational aspects of family photos. What sorts of questions does their specific position encourage each of them to ask about the photographs that they discuss? what site of family photographic practice they concentrate on – the production, image itself, its audiencing – and how they define these sites. It is evident from this comparison that while both undertake what might broadly be called ethnographic studies, there are significant differences between the methods. Consider the implications of their various methodological choices for the kinds of arguments they make. 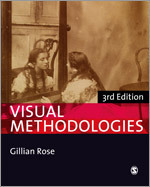 3 Did Lustig and Larsen use other methods as well as ethnography? Which ones and why? 4 How does each paper approach the question of 'power'? Lustig (2004: 184), for example, describes the assertion of good mothering by the women she studies as 'counter-hegemonic'. Larsen (2005: 419), on the other hand, talks about how 'performances are produced by power’s social script'. What implications does this have for how each scholar creates a critical visual methodology? 5 How does Larsen approach the 'nonrepresentational'? Do you agree with his yoking of the nonrepresentational to death (he is following Barthes here)? Does Lustig also explore what Larsen would call the nonrepresentational, even if Lustig herself does not use the term? 6 How do they write up their conclusions? What pictures do they choose to reproduce? Why? What ethical issues are raised by their choices? (The ethics of using photographs in research project are explored elsewhere on this website: click here for resources and here for an exercise).